Think of CoolerBot like the paparazzi of the woods. It's solar powered and waterproof, so it stops at nothing to get that perfect shot. Of course, it looks like it should be diffusing bombs, not taking nature photography. 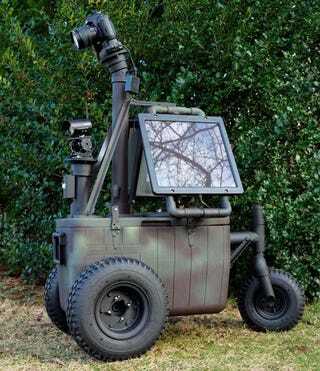 CoolerBot uses a tail-dragger design with 14" wheels in front and a 10" castering wheel in the rear. The caster wheel is mounted using PVC pipe. The robot is capable of moving in either direction. CoolerBot uses two NPC-41250 motors powered by a 10 amp hour 12 volt SLA battery. The logic is powered by a separate 10 amp hour 12 volt SLA battery and both batteries are recharged by the two onboard solar panels. The motors are driven by two Parallax HB-25s are which are controlled by a Propeller. Currently the robot is remote controlled through a 912 MHz Transceiver.